3. Fostering positive work cultures where individuals and teams deliver on shared goals. 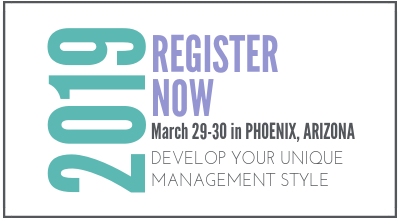 The first course in the series, "Engaging, Developing and Managing Individuals and Teams for High-Impact Practices," will take place on March 29-30, 2019 in Phoenix, AZ, and will focus on managing for engagement through clarity of purpose, leveraging unique talents and job responsibilities, performance management, individual and team development and accountability, and team results. The course will provide practical information for developing high-impact practices and will be led by Dan O'Keeffe, MD; Mike Foley, MD; and Idahlynn Karre, PhD. Who should attend: practice managers, lead sonographers, RNs, and other members of the care team who are currently involved in or will be assuming a leadership role with the practice in the near future. Fees include all course materials, as well as breakfast and lunch on March 29 and 30. Click on the aqua button below to register or contact Darryl Diamond at ddiamond@smfm.org. COURSE LOCATION: The meeting will be held at Banner - University Medical Center Phoenix (1111 E McDowell Rd., Phoenix, AZ 85006). There is complimentary parking on-site. HOTEL INFORMATION: SMFM has secured a group rate at the Hilton Garden Inn Downtown (15 E. Monroe St., Phoenix, AZ 85004) at a rate of $189/night (+ tax). To book a room, please visit: bit.ly/HIPM19HOTEL or call the Hilton Garden Inn at (602) 343-0006 to make your reservation. Please mention that you are with “The Society for Maternal-Fetal Medicine” to make sure you get the group rate. You must book your room by March 7, 2019 to get access to this rate. Attendees will be responsible for arranging their own transportation between the hotel and the meeting (taxi or ride-sharing service).